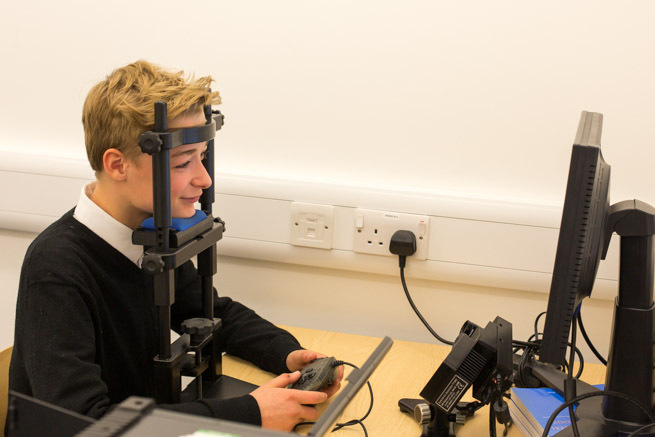 We measure people’s eye movements as they read using an eye tracker. Our eye tracker has a video camera that records exactly where the eyes are looking every millisecond. As you can see from the picture above, Adam’s chin is resting comfortably on the chin rest. The tracker is located underneath the computer monitor, looking up at his eyes. It’s completely harmless and he is able to read perfectly normally. What has been learned about reading from measuring people's eye movements? Most of the research literature has investigated reading processes in adults who are highly skilled readers. But eye movement experiments are also beginning to teach us about children’s reading. We’ll be discussing findings in more detail in future blogs, but here are some interesting findings from the literature to get us started. 1a. Sarah liked the picture of the prince in the storybook. 1b. Sarah liked the picture of the daisy in the storybook. 2a. Nick saw the goat in the zoo. 2b. Nick saw the elephant in the zoo. 3a. John used a knife to chop the large carrots for dinner. 3b. John used an axe to chop the large carrots for dinner. 3c. John used a pump to inflate the large carrots for dinner. 4a. The boy poked the elephant with the long stick from outside the cage. 4b. The boy poked the elephant with the long trunk from outside the cage. Interested in learning more about eye movements and reading? Find out about other research on children’s reading and eye movements by visiting Holly Joseph at the University of Reading and Hazel Blythe and Simon Liversedge at the University of Southampton. Keith Rayner, who did so much to further our understanding of reading, died in 2015. This paper summarises his scientific legacy. ** To learn more about the complexity of how we process complex visual information, check out these videos. ** if you're unable to locate one of these papers but would like to read it, please let us know.